The region’s first Comprehensive Orthopaedic Institute with nationally-recognized surgeons who are board certified in the tri-state’s broadest range of specialties. What does this mean for you? It means your injury or condition gets the focused expertise it needs – with options for advanced treatment not available anywhere else. More often than not, these options don’t involve surgery. But when surgery is required, our team stands apart with minimally invasive solutions that reduce your pain and recovery time. Our orthopaedic surgeons serve as faculty of the University of Tennessee College of Medicine, one of the most successful academic programs in the nation. We are the region’s only teaching orthopaedic program. This puts you in touch with more breakthrough techniques and clinical trials – all firmly supported by the rigorous standards of evidence-based medicine. 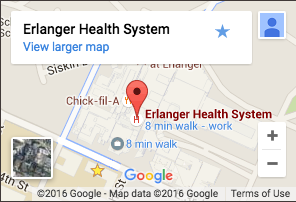 At Erlanger, you receive care from experts who train tomorrow’s doctors, and who research tomorrow’s techniques. Talk with us about the best surgery or treatment options for your knee, hip, foot, ankle, hand, or fracture.